The combo of sausage and peppers is always fantastic. 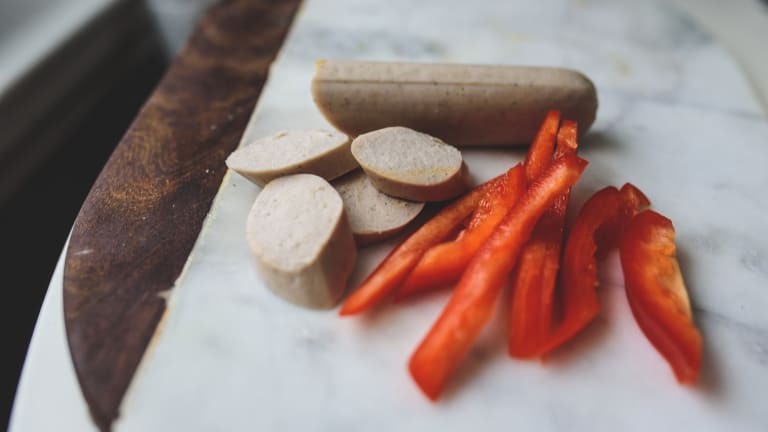 Chicken sausage is a nice, lighter alternative to regular Italian sausage. Gluten-Free: Use gluten-free rolls or bread. Vegetarian: Use mushrooms instead of chicken sausage. Paleo: Serve over cauliflower rice instead of as sandwiches. Use ghee, Paleo-friendly marinara sauce, and sausage. Omit mozzarella cheese. Spread butter on both sides of each deli roll and sprinkle with garlic salt. Place the rolls face down on a cookie sheet. Place cookie sheet in oven for about 8 minutes, or until the buttered sides of the rolls look toasted. Heat 1 Tbsp olive oil in a skillet over medium heat. Add sliced pepper, onions, and full chicken sausage links to pan. Cook until peppers and onions are tender and browned and until chicken sausages are seared on all sides. Warm the marinara sauce in a small saucepan. To assemble sandwiches, top each roll with a sausage link, peppers and onions, marinara sauce, and a slice of mozzarella cheese. Place sandwiches back on the cookie sheet and bake in the oven a few minutes, until cheese is melted.